Big Congratulations to Alyssa Ulrick! 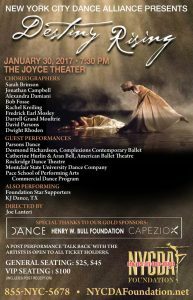 On Jan 30, at the culmination of the Destiny Rising show at the Joyce Theater in NYC, Alyssa Ulrick was awarded an $8000 Scholarship for the college of her choice by the New York City Dance Alliance Foundation. We are so proud of her, and are excited to continue to watch where Alyssa’s dance journey takes her! Alyssa began dancing when she was just two years old, joining Northland School of Dance in third grade, where she is now a Senior in our Competitive Dance Program. I was among students that were chosen for invitation to audition for the scholarship being awarded by the NYCDA Foundation and I accepted. The audition was held in New York City, consisting of an hour of Ballet and an hour of Contemporary Dance, while being judged and scored at the end of each hour. 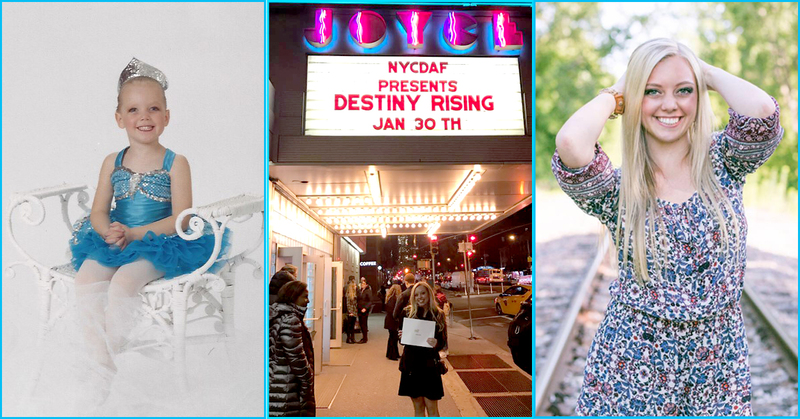 The resulting awards were announced during the Destiny Rising show, which is a big performance that is put on by NYCDA to help raise money for the Foundation. All of the participants that auditioned were in the audience during the show, and they called about eight dancers out of all who auditioned on to the stage to receive their scholarship awards. These scholarships can be used at any college of their choice. I was completely in shock when I even heard my name called to the stage, because everyone at the audition so was talented and amazing! Then, when I found out I was awarded $8,000, tears of joy filled my eyes. It was a feeling I have never felt before and it took me awhile to process what had actually happened. It was amazing being on stage knowing there were so many amazing Company directors and choreographers watching in the audience who have, and continue, to inspire me. Afterward, I felt so completely blessed to be given such an opportunity which wouldn’t have happened if it weren’t for Northland School of Dance, especially Corrie and Teresa, who have pushed me and believed in me for so long, and have made me the dancer I am today. I also felt very blessed over the number of people that went out of their way to congratulate me. To have so much support behind me by so many people was truly an amazing feeling, and I felt so happy & proud to call Northland my home, and for the encouragement from every teacher, parent and student there. New York City Dance Alliance has been inspiring, educating and empowering dancers since 1994. In 2010, Joe Lanteri launched the non-profit NYCDA Foundation to further it’s mission in investing in and empowering the next generation of dancers with a scholarship program. Since it’s inception in 2010, the Foundation has awarded more than $1,600,000 in college Scholarship funds. For more information on the Foundation, visit NYCDA Foundation.